The Fourth Doctor drops in on Fun World before opening day for a deadly game of Dodgem. This is a prequel to Silence in the Library. Part of the fun (or horror) of a prequel is watching the Doctor become aware of a formidable monster for the first time, piecing together clues and deducing what many fans already know. Also, all the scriptwriters for this year’s Classic Doctors, New Monsters have taken the opportunity to further develop new Who monsters who appeared for only one story. Here’s the trailer for this boxset. As so often, the Doctor encounters humans who are as much of a pest as the foe they’ve come to exterminate. They’re a seasoned group of monster hunters — think Ghostbusters (or, more aptly, Aliens) except that they’re trained to take down physical threats. As usual, they don’t think they need the Doctor’s help. Doctor: Honestly, why are some people so resistant to staying alive? But there’s also moments of horror, suspense, action, and pathos. The Vashta Nerada are suitably scary in audio (I should note I haven’t seen The Silence in the Library yet — blasphemy! — but I was able to get the idea, and the heebie-jeebies). 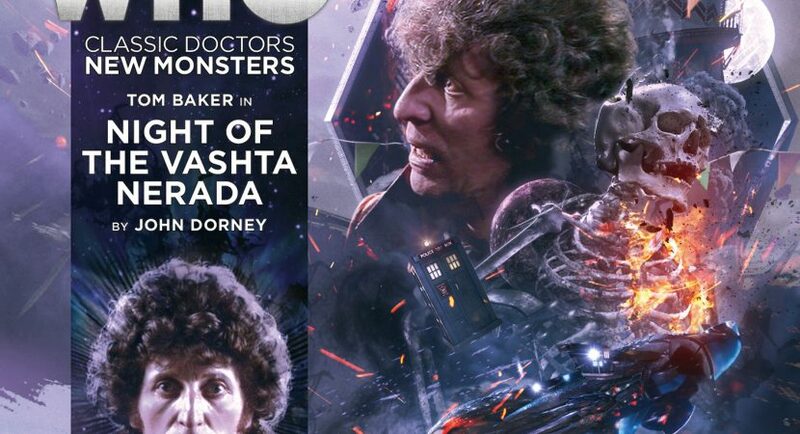 Also, while I’ve neglected to pay enough attention to music in my reviews, the soundtrack is almost orchestral, a majestic style that suits Tom Baker rather well. Once again, author John Dorney has created a strong set of guest characters: no-nonsense Amanda Steele’s crack team of exterminators (plus their not-so-enthusiastic psychic, whom the Doctor befriends), as well as yet another obnoxious American, the owner of Fun World. They provide the Doctor with ample opportunities to lecture humans on pride, greed, fear, compassion, even environmentalism. Also, of course, he enjoys tweaking them with his muttered asides and quips. Continuity note: I think this must be set after The Deadly Assassin, although it could be after Invasion of Time. The Doctor mentions feeling a little down after a companion’s recent departure, but there’s no mention of K9 recharging his batteries back in the TARDIS. In the “here we go again” department, I’m getting a little weary of stories where everybody dies. The death of the psychic the Doctor befriended is particularly painful. At least this time Four gets a dose of the fallibility usually ascribed to his successor.